Given the myriad challenges inherent in attribution, and the sheer complexity of it, Adroll decided against writing yet another ‘whitepaper’, joking that since most marketers use custom attribution models, the best Adroll would be able to create was a murky, grey paper. 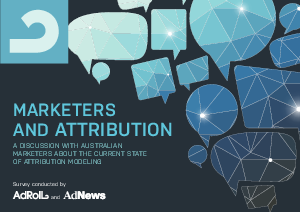 Instead Adroll talked to professionals in the field about attribution and published a ‘discussion paper’ to explore every aspect of this complex and ever-changing topic. In the report we examine a wide array of topics including the best attribution models available, challenges traditional models are facing in the new media landscape, roadblocks to change, and the future of attribution modeling. Adroll trusts this paper will be more useful to marketers than a traditional whitepaper, and will hopefully become a conversation starter and springboard to action and debate within the industry.